The first trains full of passengers and freight ran between Durango and Silverton in 1881. From the beginning, it was promoted as a scenic railway, but it was built primarily to carry gold and silver ores mined in the San Juan Mountains. This was a train ride we will never forget. We misjudged how long our drive would take from Colorado Springs to Durango and arrived much too late to enjoy a pleasant meal and restful night in the historic Strater Hotel (established in 1887). The decor was great but we were up and out early to catch our 8:00 AM train to Silverton. We had reserved tickets to ride in the last car of the train, a converted gondola with bench seats and a roof, but open to the fresh air. We thought our jackets would keep us warm until members of the train crew walked by with heavy winter coats, hats, and gloves. We had forgotten that the train would be climbing into the mountains, not just rolling past pretty scenery. We huddled a bit to keep warm, but temperature concerns gave way to fascination as we followed the Animas River into the mountains. The scenery was wild and rocky and we enjoyed unobstructed views from the end of the train. Some views were more thrilling than others, as our tracks sometimes perched on narrow ledges overlooking long drops to the river gorge below. After three and a half hours we pulled into Silverton, where we bought heavy sweatshirts and lunch and then boarded our train for the trip back. This is an all-day train ride, although you can ride a bus instead of the train in either direction. Durango is a long way from anywhere, but the experience is a great one if you want to enjoy rugged western scenery from seats on an authentic steam train. 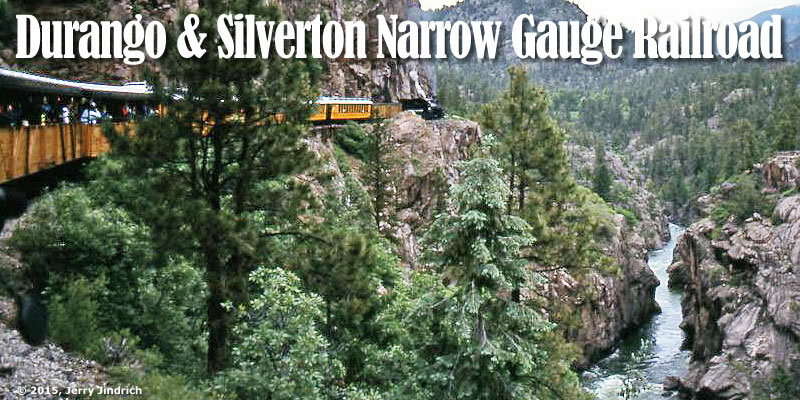 The last photo above shows a train using the wye at Silverton to turn aound for the trip back to Durango.